Price of the commodity rises as the demand for the commodity goes up. Weight of a person increases with the increase in age. Temperature rises with the rise in the sun light. With the help of correlation analysis, we can measure the degree of relationship in one figure between different variables like supply and price,. Income and expenditure, weight and volume manufacturing in an industry and so on..
We can estimate the value of one variable on the basis of the value of another,. This function is performed by regression analysis, which is based on correlation. A trader makes the estimation of costs, sales, prices etc. with the help of correlation and makes appropriate plans. If two variables X and Y move in opposite direction i.e. if one rises, other fails, and if one fails other rises, then it is called as negative correlation e.g. demand and price. When we try to find the relation between two variables then it is called simple correlation. Correlation among three or more variables is the study of two variables taking one variable as constant. Multiple correlation is the study of relationship among three or more variables under different conditions. Linear correlation is refers to the relationship between two variables such as the ratio of two variables remains constant throughout. It is best described by straight line. It refers to the amount of change in one variable does not bear a constant ratio to the amount of change in the other variable. e.g. when every time X rises by 10%, then Y rises by 20% sometimes and sometimes by 10% and sometimes by 40% then there is no straight line relationship exist between two variable rather a curve like relation exit between the variable and it is called as curvilinear correlation. The degree of correlation is expressed by the Karl Pearson's Coefficient of Correlation denoted by (r). The numerical value of (r) always between -1 and +1. On the basis of the value of (r) the Correlation has following degree of correlation. 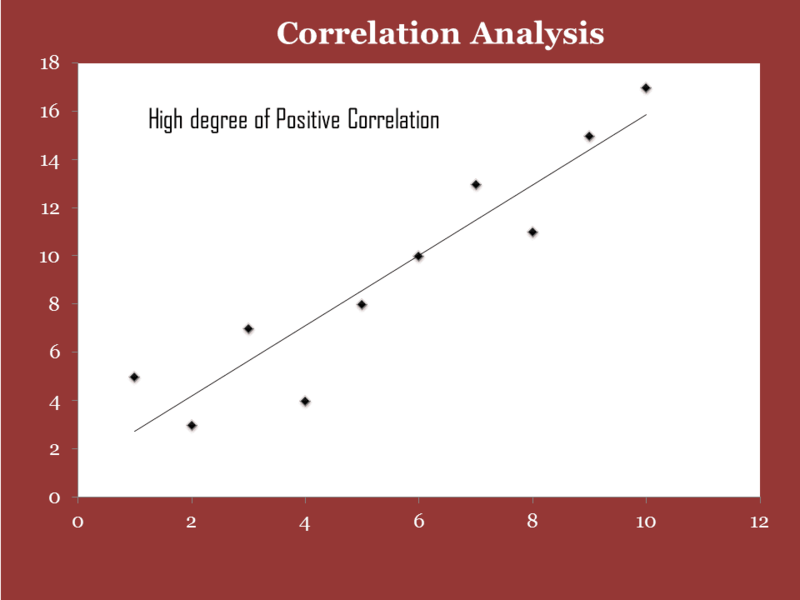 When the value of (r) comes in between either +0.75 to +1 or -0.75 to -1 then the correlation is called High degree of positive correlation or High degree of negative correlation. When the value of (r) comes in between either +0.25 to +0.75 or -0.25 to -0.75 then the correlation is called Moderate degree of positive and negative correlation. When the value of (r) comes in between either 0 to +0.25 or 0 to -0.25 then the correlation is called Low degree of positive and negative correlation. When there is no correlation between the variables then the value (r) comes zero and this situation is called absence of correlation.